Judge John Reilly, now retired, was the youngest judge ever appointed to the Provincial Court of Alberta. For most of his 33 years on the bench he was the circuit judge for the Stoney Indian Reserve at Morley, Alberta. During his career he became interested in aboriginal justice and saw the failure of the “white” legal system to do justice for aboriginal people, the harm caused to them by Canadian colonialism, and the failure of all levels of government, including tribal government, to alleviate their suffering and deal with the conflicting natures of European-style law and Indigenous tradition and circumstance. As a result of these realizations, Judge Reilly vowed to improve the delivery of justice to the aboriginal people in his community and used his perceived power as a jurist to make changes to improve the lives of the people in his jurisdiction. Along the way, he came into direct conflict with Canadian judicial administration and various questionable leaders among the echelons of both Canadian and First Nation governments. John Reilly’s first book, Bad Medicine: A Judge’s Struggle for Justice in a First Nations Community, was a Canadian bestseller that sparked controversy and elicited praise nationwide for his honest portrayal of First Nations tribal corruption. 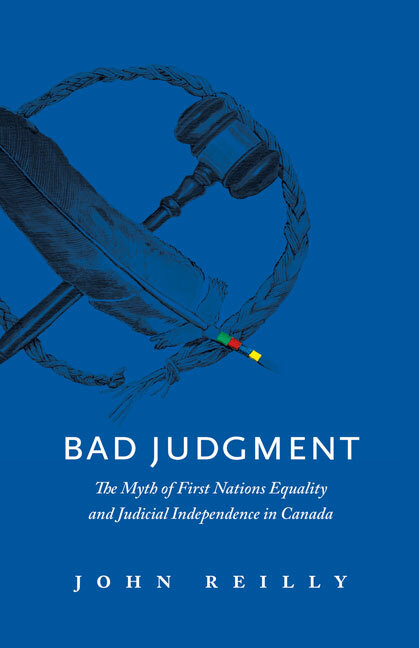 Bad Judgment details Reilly’s battle with the Canadian justice system and the difficulties he faced trying to adapt Eurocentric Canadian law for the benefit of First Nations people across the country.